Stevland Hardaway Judkins (born May 13, 1950) known by his stage name Stevie Wonder, is an American musician, singer-songwriter, record producer, and multi-instrumentalist. A child prodigy,Wonder became one of the most successful and well-known artists on the Motown label. He has recorded 23 albums and more than 30 U.S. top ten hits,such as Superstition, Sir Duke and I Just Called To Say Love You (which topped all the charts the board it faced). He has written and produced songs for many of his labelmates and other artists as well. His music, which concerns love, peace, care and knowledge about the outside world has won him 25 Grammy Awards(the most awarded to a male solo artist). Wonder plays the drums, guitar, synthesizers, congas, and most famously the piano, harmonica, and the keyboard. In 2009, United Nations dubbed him "Messenger of Peace". He was born on May 13, 1950 in Saginaw, Michigan. His real name is Stevland Hardaway Judkins but he later dropped the name Morris and it has been his name for his live. He has been blind nearly since his birth. While in the hospital. his incubator was left too warm, which caused his retina detached and his optic nerve was gone forever. In 1961, Wonder sang his own composition , "Lonely Boy" for Smokey Robinson of The Miracles. This earned wonder his contract with Motown and he was mentored by Clarence Paul.Wonder's first album, The Jazz Soul of Little Stevie, was released by Motown Records in 1962 when Wonder was 12 years old. This album was to showcase Stevie's instrumental talents and contained to compositions that Wonder and Paul co-wrote - Session Number 112 and Wondering. He released his second album Tribute to Uncle Ray later that year, mostly covers of Ray Charles's songs including a fresh song, Sunset. These two albums were released in reverse order of recording and failed to gain recognition.Clarence, feeling a song was coming on set Mother Thank You for release as a single, which was pulled and replaced with I Call It Pretty Music But The Old People Call It The Blues. The song almost broke into the Billboard Hot 100, appearing at 101 before dropping out of sight. The followups Little Water Boy and Contract on Love had no success, despite the latter appearing on the Uptight album. His first live album Recorded Live: The 12 Year Old Genius reached number one in the Billboard 200 and contained the live two part single Fingertips, This made him the youngest musician ever to have a number one album in the United States and the youngest artist ever to top the chart. His next few singles were not successful; his voice was changing as he got older and Motown was considering cancelling his contract. To save him, a fresh single "Up-Tight", co-written with Wonder was recorded in 1965 with reports saying it was based on a rhythm he had been humming and during recording the lyrics were sung back to Wonder as they were unavailable in Braille and that he "never missed a beat". The single charted at No.1 and an album was rushed into production the following year to back it success. This established Wonder as a genuine Motown hitmaker. Since then, he has used a Hohner clavinet. In 1971, Wonder released the album Where I'm Coming From, an album he expected to see what was going wrong with the world (featured the single "If You Really Love Me". Around the same time his label mate, Marvin Gaye released a similar album, What's Going On, which spawned three singles. The albums have been compared with Marvin's seen as successful, whereas Wonder's seen as "self-indulged, undistinguished, pretentious" and overall lacking in unity and flow. Wanting to become a more independent artist, Wonder allowed his old Motown contract to expire. Wonder moved to a new studio and was taught synthesiser engineering. He then met Malcolm Cecil and Robert Margouleff who introduced him to an electric orchestra known as TONTO (The Original New Timbral Orchestra) Around the time of its release the previous year, it garnered a lot of attention. On March 3, 1972 Wonder released a new album by the name of Music of My Mind, with all songs flowing together thematically. The album spawned the singles Superwoman and Keep On Running. The album was a success with critics finding it representative of his artistic growth. Although he was separate from Motown, he would still submit his albums to his old record label, Tamla. Cecil and Margouleff helped him engineer the TONTO synthesiser and so were listed as associate producers. This began Wonder's classical period and marked a long collaboration with TONTO's Expanding Head Band. The albums that followed were Talking Book and Innervisions, the latter winning album of the year in 1973. Wonder won his first four Grammy Awards in 1973. Two of the awards were for his single "Superstition" from Talking Book. In 1974, Wonder's seventeenth album Fulfillingess' First Finale was released, also winning album of the year. It featured two number one singles, "Boogie on Reggae Woman", and "You Haven't Done Nothin", a hit which launched criticism against The Nixon Federation - funny enough, 2 days later, Richard Nixon resigned. Wonder won another four Grammys for the album that year. It was Wonder's second number one album. Wonder's next album Songs in the Key of Life also reached number one. This was Wonder's most critically acclaimed album and the Library of Congress called it culturally, historically or aesthetically significant. It spawned five singles , Sir Duke, a song explaining the pleasures of music, I Wish wishing for childhood days to come back As a ballad of love which will last till The Impossible happens, Another Star a fast-paced Cuban style heartbreak ballad which featured on BBC's promotional video for the 2014 World Cup and Isn't She Lovely a song inspired by the birth Wonder's daughter, Aisha Morris. (Wonder would not release it as a single although instructed by a Motown executive to do so.) The former two songs reached No.1 on the Billboard charts. In 1979, he released a soundtrack album, Journey Through The Secret Life Of Plants for a documentary The Secret Life Of Plants. The album used a computer melodian virtually throughout. The album contain the No.1 ballad Send One Your Love. The album had been called odd goofy nerdy and foolish. Wonder blamed Motown for not promoting the album properly. In 1980, Wonder released Hotter Than July which included I Ain't Gonna stand For It, a country-style song about a man whose property has been repeatedly trespassed, Master Blaster (Jammin'), a reggae tune dedicated to Bob Marley, "Lately", a ballad and "Happy Birthday", a song in memory of Martin Luther King Jr used for Wonder's campaign to make Luther's birthday a national holiday. His next was a greatest hits album titled Original Musiquarium I featuring 4 new singles That Girl, Do I Do, Front Line and Ribbon in The Sky. In 1983, Wonder contributed Stay Gold to the drama The Outsiders. He then scheduled an album to be titled People Work, Human Play. The album never surfaced and instead 1984 saw the release of his next soundtrack album The Woman in Red.It spawned the hit single "I Just Called to Say I Love You" which reached number one in all the countries with charts at the time, therefore becoming his bestselling record. It was Wonder's only number one in the UK. It was number one there for six weeks. In 1985 Wonder released the digital album In Square Circle and featured on Dionne Warwick's single "That's What Friends Are For" with Elton John and Gladys Knight. It reached number one in the US. Wonder shared the Grammy Award for Best Pop Performance by a Duo Or Group With Vocal. In 1987 Wonder released the album Characters which featured hit singles "Skeletons" and "You Will Know", but was subject to mixed reception. Michael Jackson's album Bad was released. Wonder featured on the album's fifth song "Just Good Friends". In December 1987 Wonder released a single called "Get It", a duet with MJ in turn for Just Good Friends. In 1991, Wonder's 3rd soundtrack album, Jungle Fever was released a month before the drama film of the same name. The album helped Wonder climb back into the Top Ten in album charting. In 1995 Wonder released Conversation Peace. It was his first album that was not a soundtrack since 1987. One single, "For Your Love", was released from the album. It won 2 Grammy awards for Best R&B Male Vocal Performance and Best R&B Song. In 2005 Wonder released his first album in ten years, A Time to Love. Reviewers were upset with the fact it took ten years for him to release a new album with fresh material. On June 25, 2011, Wonder performed at the opening ceremony of the 2011 Special Olympics World Summer Games in Athens, Greece. Wonder said in 2013 that he will release 2 new albums in 2014, and is making a third. The current working titles are Ten Billion Hearts, When The World Began and Gospel Inspired By Lula. 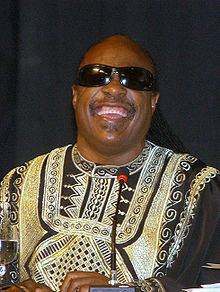 ↑ "Stevie Wonder - Awards". AllMusic. ↑ Gibsone, Harriet (30 October 2013). "Stevie Wonder confirms first new albums in eight years" – via www.theguardian.com. Hear Stevie Wonder (music and interviews) on the Pop Chronicles (1969). This page was last changed on 22 February 2019, at 19:32.